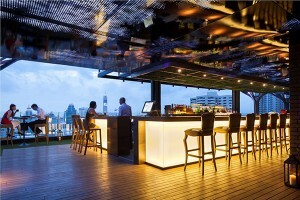 Bangkok’s newest sky high restaurant is the latest to carry on the buzz of new bars and eateries on Sukhumvit. Above Eleven is the latest addition to Sukhumvit’s sky-high restaurants, sitting on the 33rd floor of the Fraser Suites on trendy Soi 11, Above Eleven has defined itself as a cut above the rest and one that serves a different kind of cuisine; a fusion of Peruvian and Japanese called ‘Nikkei’ in Peru. Nikkei is a gastronomic novelty that has been praised by restaurant consultants including famed New York-based Michael Whiteman as being the next big trend for discerning foodies. Peruvian food itself is an interesting melding of diverse tastes originating over 500 years ago from the culinary traditions firstly of Spain then Africa, Japan, and China. Individually these exotic fares have gained international appreciation but Nikkei is decidedly different combining the best of each culinary tradition into a concoction of delight. Above Eleven’s menu is mainly based on a delicious selection of appetisers and main courses that are a treat for the taste buds and the eyes. Being an Nikkei novice and curious to try the fare I ventured along to Above Eleven and found myself in a green space away from the hustle and bustle of noisy downtown Sukhumvit and transported to a virtual garden in the sky. The conspicuous large and long illuminated bar is an ideal stopping off point for a pre-prandial drink or two. I tried the bar’s signature cocktails, which the handsome barman told me is a favorite in Lima: the Pisco Sour, an enticing mix of Pisco, a clear Peruvian grape brandy; lime juice, egg whites, and simple syrup. I watched fascinated as the mixologist performed contortions and gyrations, ala Tom Cruise in the movie “Cocktail,” and combined the ingredients, vigorously agitated the liquids and eventually decanted the mix into a frosted glass. A head of foam floated on the cream-colored liquid, the final touch is the addition of a few teardrops of Angostura bitters sprinkled onto the foamy head. The combination of the tart fresh lime-juice and bitters certainly gave the drink a bite that pursed my lips and tantalized my tongue. The cost of this delight is Bt350. Looking down the drinks menu I found many a cocktail that I determined to return to try. The Pisco downed, I trod the springy carpet of lush fake turf to the outside eating area; a large space filled with ecologically sound wooden furniture. A tall glass wall provides diners with an uninterrupted view of the city. I never tire of watching the sun fade and the lights flicker into life over this sprawling metropolis. Above Eleven is a haven of peace and ideal to sit and sip a cool chardonnay as I in contemplation looked at the glittering stream of car headlights below and reflected on life in this one of the world’s greatest cities. The quietly playing background hip house music helped my reverie. But on a Wednesday the place vibrates with the sounds of salsa and lively Latin rhythms. I always associate a small menu with quality, fresh ingredients and so it is at Above Eleven. 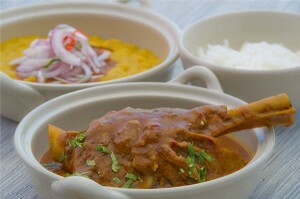 I like lamb so opted to try the Seco de Cordero, a slow-cooked lamb shank stew; it is hearty and slightly spicy. The stew thickly covered the lamb and beckoned irresistibly to me. I was not disappointed. The meat fell from the bone and once transported to my mouth, the full flavor of the aromatically spicy stew seemed to seep into my soul (Bt950). It was carnivore bliss. 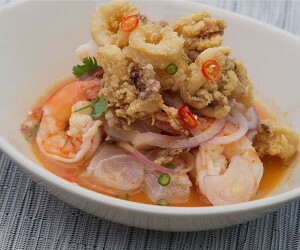 Stealing a glance at my companion’s dish of Cebiche (Bt550), a combination of sea bass, prawns, and deep fried calamari that was too much to resist just a taste. This dish was familiar to the Incas, Above Eleven have made it their own special creation; a tower of fish, prawns and deep fried calamari in a spicy sauce had my mouth-watering on sight. Besides the excellent eating experience the cool and calm atmosphere, Above Eleven is a great start to a night of carousing and partying. 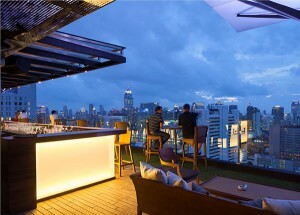 The cocktails, wine and atmosphere are conducive to a romantic dalliance so why stray further down the soi? Enjoy Above Eleven above Soi Eleven. Sukhumvit 38/3, Soi 11, Bangkok. Getting there: Nearest Skytrain station is Nana just a short walk up Soi 11 to the Fraser Suites. Opening hours: Daily from 6 p.m. to 2 a.m.